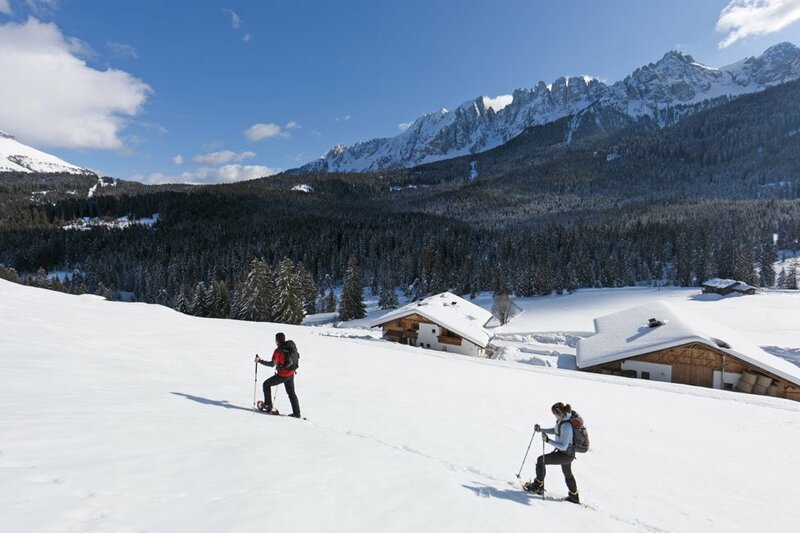 Covered by deep snow – that’s how the South Tyrolean holiday region of Nova Levante awaits you during the winter months. White powder snow covers the mountain summits of the Catinaccio and the Latemar. The high peaks with their pale caps form a striking contrast to the blue sky. Nova Levante counts up to 300 sunny days a year, and in the winter the region awaits you with many leisure activities – from skiing to tobogganing in the winter wonderland. 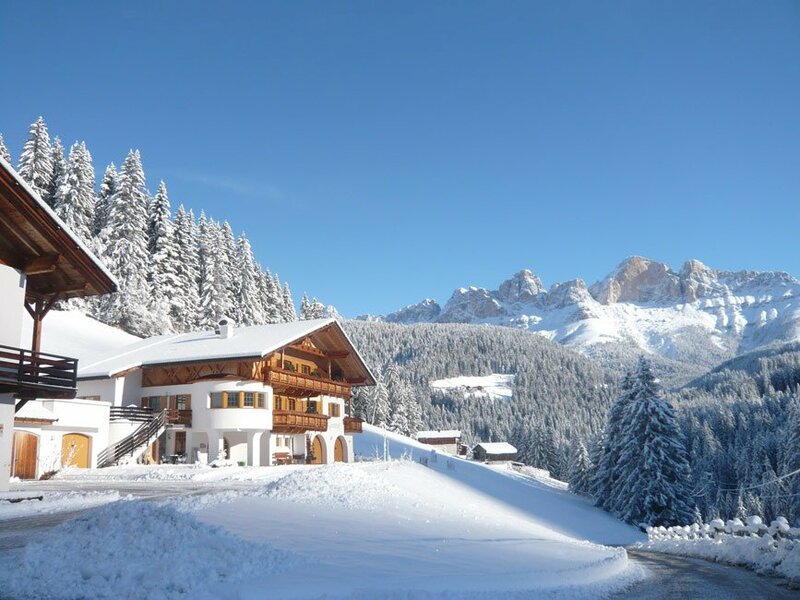 A picture-book landscape welcomes you upon your arrival in your winter holiday in the Dolomites. Your holiday accommodation on the farm Karerhof is only five minutes away from one of the most traditional and sunniest ski resorts in the South Tyrolean Alps. Look forward to endless winter fun in the snow. 40 km of perfectly groomed slopes await your visit. 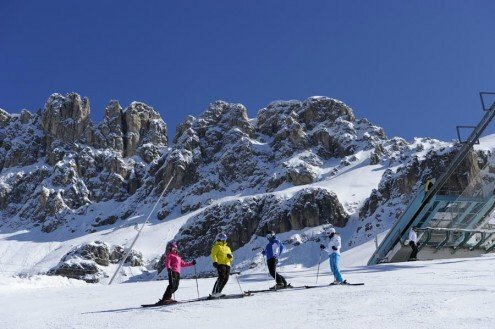 16 ultramodern lifts ensure rapid and safe transportation to the ski area. 170 snow cannons guarantee untroubled fun on the slopes from December to April. The ski area Carezza extends up to an altitude of 2,300 meters. At the highest point you may enjoy the stunning views of the surrounding mountains. Cross-country skiing friends can expect a total of 17 of kilometres of groomed trails in the region. The farm Karerhof with its cosy apartments is situated in the heart of the Dolomiti Superski carousel. Snowshoeing, ice skating, tobogganing – off the slopes, in winter there is a variety of recreational activities that will make your winter holiday in the Dolomites diverse and entertaining. Guided ski tours and snowshoe excursions are offered in the snowy season in Nova Levante. The toboggan runs Hubertus and Schwarzsee guarantee carefree winter fun for young and old. In Nova Levante you’ll have the opportunity to have fun even after dark – on the floodlit toboggan run. More than 20 kilometres of winter hiking trails in the surrounding area are cleared regularly. Walk across beautiful snow-covered meadows and through romantic forests. Enjoy the wonderful trails for a leisurely walk into the glistening winter wonderland of Nova Levante.